This week, a new opportunity for Star Wars fans (or not-yet Star Wars fans) to experience the movies opened up at Walt Disney World. 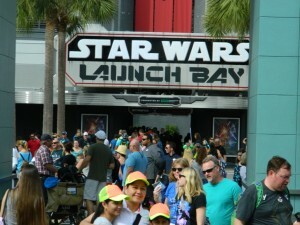 On Tuesday, several attractions were opened at Disney’s Hollywood Studios, in addition to “Star Tours: The Adventures Continue”, which has been at the park for years. 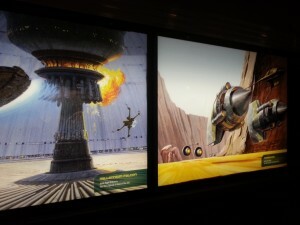 The “Star Tours: The Adventures Continue” ride, however, is not the same typical ride park guests have ridden, since, as of a couple weeks ago, riders experience a scene on Jakku, wherein the rider follows the Millennium Falcon being chased after by three TIE fighters (and seeing it shooting at them) and ending up going through the remains of a downed Imperial Star Destroyer (most likely from the battle of Jakku). While in the Imperial Star Destroyer, one sees up close some junkers who are combing the ship for parts. Once one leaves the ship, we get a message from BB-8, who cutely interacts with R2-D2, then we get sent off to one of the other planets in the ride. 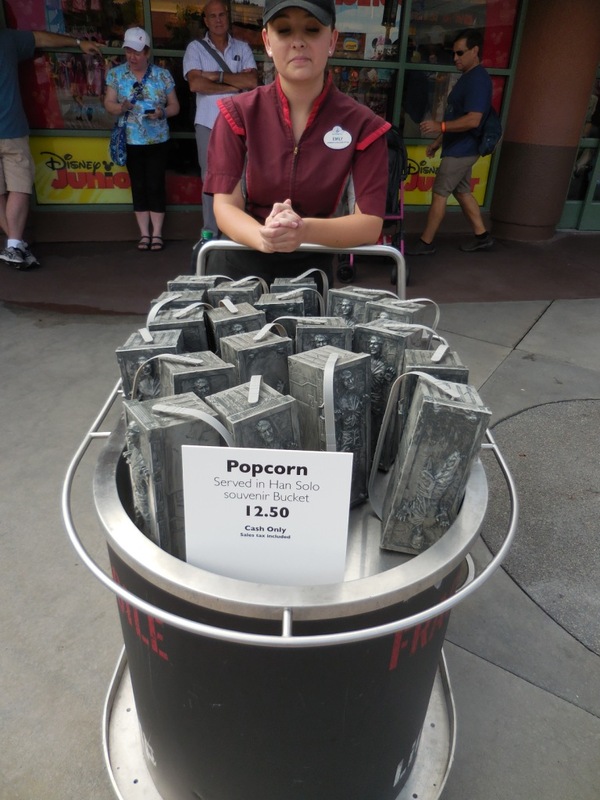 This is the same set-up as at Disneyland. 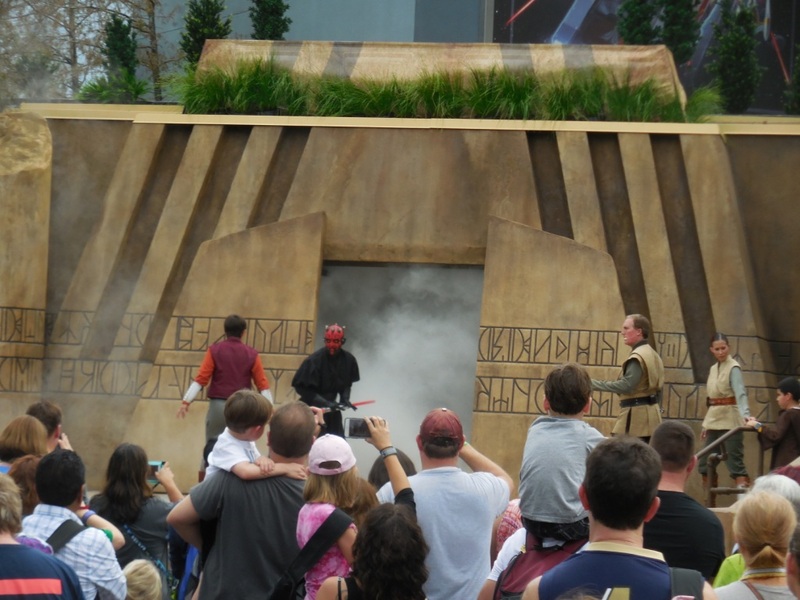 Right next to “Star Tours: The Adventures Continue” is the newly-opened Trials of the Temple, an opportunity for kids to experience some training and see actors as various Star Wars characters. 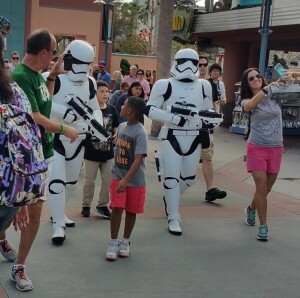 This was neat to see, since Disneyland did not have this going on during the first day of its “Season of the Force”. I will point out that one needs to sign one’s child up for this ahead of time and have the child meet at a separate location (near the Indiana Jones gift shop). In the ABC Sound Studio, one can now watch “Star Wars: Path of the Jedi”, which is a movie that ties in key elements of Episodes I-VI, which is wonderfully done and has great music, that leads the viewers into Episode VII, getting us ready to immediately watch Episode VII. In the Animation Courtyard, there were a couple of cast members dressed as First Order stormtroopers, humorously interacting with park guests. 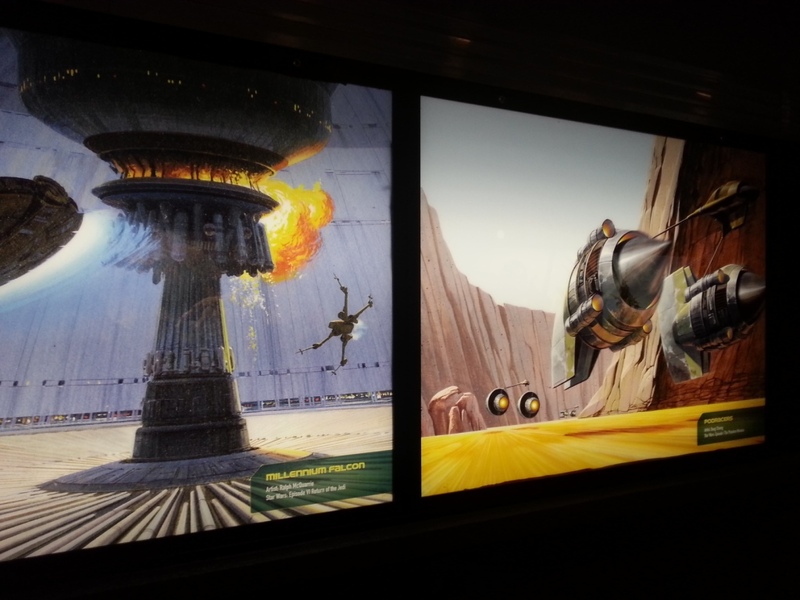 Passing them, there is Star Wars Launch Bay, which opened on Tuesday, where, while getting in line, one passes numerous lovely concept art for Episodes I-VII and for Star Wars Rebels. Once one gets through the line, one then enters a movie theater, where a little movie is shown, with various creative Star Wars people speaking about the movies, such as Kathleen Kennedy, JJ Abrams, Rian Johnson, Pablo Hidalgo, Rayne Roberts, Kiri Hart, and more. Once one exits, one enters into another area, where guests can wait in line to meet either Chewbacca or Darth Vader or choose to continue walking along, viewing models, vehicles, and costumes from the previously-released movies. 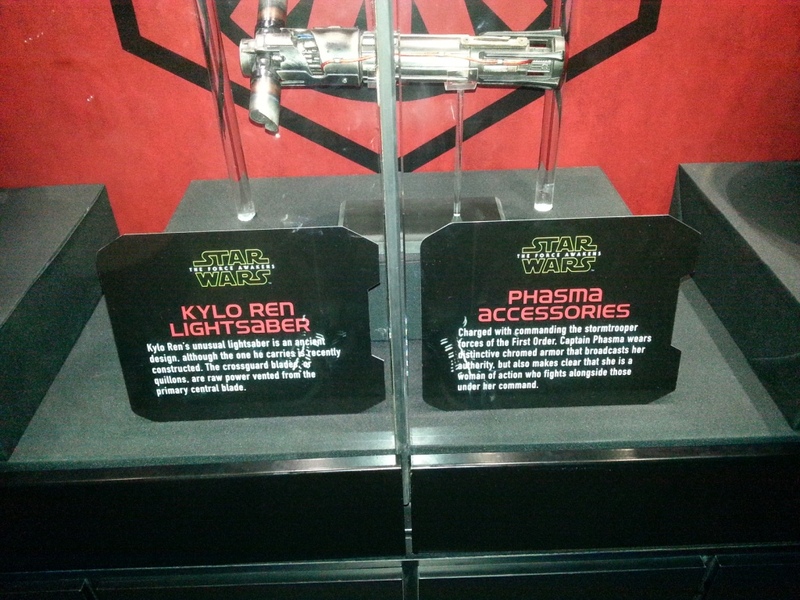 Continuing along, one then gets to view artifacts from Episode VII, which is really neat! Once one passes through that room, one is let out into, where else, a gift shop, where one can purchase various Star Wars merchandise. 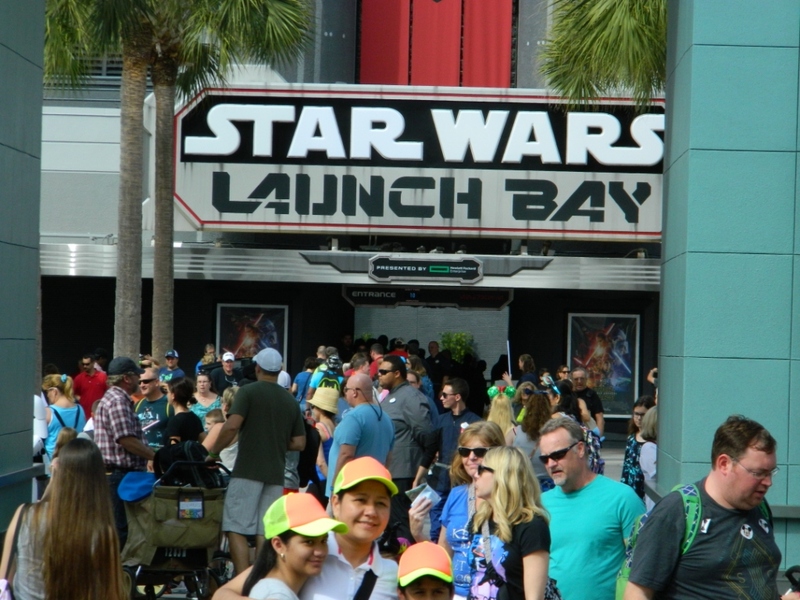 This new area for purchasing Star Wars merchandise at the end of Star Wars launch bay is only one of three places in Disney’s Hollywood Studios. One of the others is Tattooine Trader, located where “Star Tours: The Adventures Continue” lets out, as it has done for years. 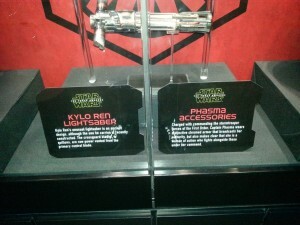 The other one is Watto’s Grotto, located near the Streets of America, which features, amongst other things, a lot of apparel, as well as a lot of Episode VII items. Also, there were various Star Wars food/beverage options, such as BB-8 mugs with lemonade in them or popcorn containers which were Han Solo in carbonite. 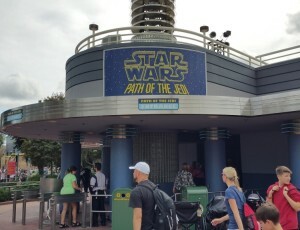 One thing that struck me on opening day of these new Star Wars attractions and shopping options is how short the queues were – it was great to be able to view them all within just a few hours!